The State Capitol Dome Story. 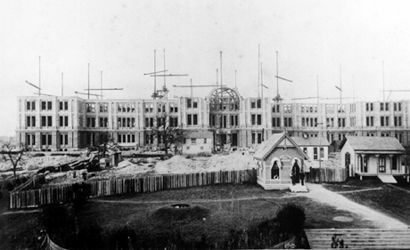 From his office in the 1857-vintage Land Office Building, Land Commissioner W.C. Walsh had been watching the construction of the new Capitol since the first shovel of dirt was tossed on Feb. 1, 1882. Not only was he witnessing the biggest construction job to that point in Texas history, Walsh had an official reason to follow the building’s progress – he sat on the Capitol Board, the state entity overseeing the project. 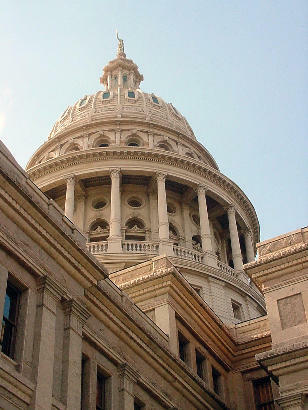 By the spring of 1887, the red granite, Greek cross-shaped base of the future statehouse had been completed. Soon, work would begin on the towering dome that would give the four-story government building (the east-west wings are only three stories) its distinctive silhouette. Born in Dayton, Ohio on the eve of the Texas Revolution in 1836, Walsh had come to Texas with his family when only four. They settled in Austin when all it amounted to was an assortment of log cabins lining a broad thoroughfare called Congress Avenue. Following his graduation from Georgetown University in Washington, he returned to Texas and went to work as a clerk in the land office. Walsh stayed there until the beginning of the Civil War, when he signed up to fight for the Confederacy. Though wounded three times, he survived the war. 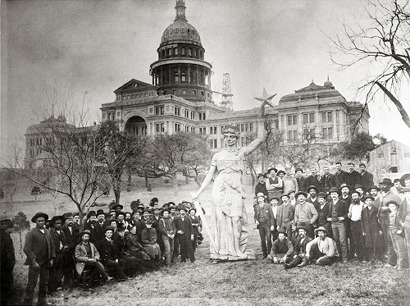 Back in Austin, he farmed and ran a rock quarry near Barton Springs until 1873, when he became chief clerk of the House of Representatives. Five years later, Governor R.B. Hubbard appointed him to fill the unexpired term of Land Commissioner J.J. Gross. Elected to a full term in November 1878, Walsh would serve until 1887. As the new Capitol slowly took shape, as a member of the body charged with making all the spot decisions that come up during such a large-scale project, so did Walsh’s layman’s knowledge of architecture. Now, with construction about to begin on the dome, Walsh grew increasingly uneasy. He figured the weight of the brick, added the weight of the substructure, and went to bed, not liking the number he got. Assuming he had made a mistake, the next night he went over his calculations and got the same result. “The weight shown not only wiped out the ‘factor of safety’ but exceeded the theoretical resistance of the foundation,” he wrote. In other words, the base of the Capitol would not support a brick dome. At some point, either during construction or over the course of time, it likely would come crashing down and possibly take much of the rest of the building with it. Walsh tore up his calculations and burned the scraps. “As far as I could, [I] dismissed the question from my mind for ten days,” he continued. But then he ran the numbers again, coming to the same catastrophe-protending figure. This time he submitted the numbers to someone else, who came to the same conclusion. Walsh did just that, but the timing was bad. All the state officials who sat on the board, including Walsh, were leaving office. Only the state treasurer would still be on the board. “The general thought was that the outgoing Board had brought the building through troubles and discouragement to its practical completion, and it was now too late for the retiring board to take up the question—besides the new Board ought to have something to worry over,” Walsh wrote. Now a private citizen, Walsh remained concerned. When the new board took no action on the dome issue after its second meeting, Walsh took the matter to the new governor, Sul Ross. The governor asked Walsh to submit his concerns in writing and shrewdly asked if he minded the document being made public. The former land commission said he had no problem with that, and soon his belief that the blueprints for the new capitol contained a potentially disasterous design flaw hit the state’s major newspapers. Disaster likely averted, Walsh was still not totally satisfied. He sent Capitol architect Elijah E. Myers a copy of the report on the dome, asking for “at least a personal explanation.” Myers’ secretary replied that his boss was in ill health and unable to answer Walsh. 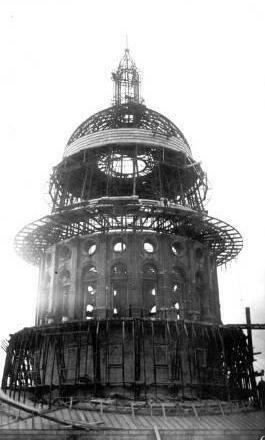 By the time Walsh died on August 30, 1924, the ironclad Capitol dome had stood for more than a quarter century and has now made it past 120 years.